I’m offering these reflections honestly, as part of my own thinking and growing, and to share what I see. I’m claiming no special awareness or insight, and I really don’t want to compare how enlightened I am to anyone else. Spoiler: not very. You probably have more non-white friends than I do, and that’s cool. My self-reflection is about what I can learn about myself, and how I can do better. This made me curious. I used my Facebook friends list, which inflates my friends in both number and diversity, by including people who would otherwise be separated by geography. Still, it’s a sample set I could easily identify. I know it’s not a perfect or scientific exercise, but it’s a place to start. 35 people– 4%– are people who are black. An additional 41 people are non-white members of other ethnicities (5%). In total, 76 of my Facebook friends (9%) are not white. As I reflect on this, several things come to mind. 1. My shelter and privilege– and loss– as someone who has lived primarily in 95%+ white communities. I grew up in a town of less than 1000 people. In seminary, I looked back at some demographic information from the 2000 census in the larger town nearby, the place where I went to high school. There were listed on that census “African American: 6.” Six people. In the whole town. I knew the names of all six. I don’t think that’s a good thing; homogeneous communities don’t help individuals learn about much beyond their own experiences. And while I did learn a little from the experiences of at least three of those six people– black men as close as family– nothing can undo the whiteness of my childhood. It’s not bad, per se. It just is. Compared to my friends who have lived in more populated and diverse areas, I start farther back on the line when it comes to seeing, owning, and dismantling my privilege and racism inherent in homogeneity. 2. The tremendous gift of friends who have shared their experiences with me so I can see beyond the blinders of my social location. I’m embarrassed, looking back, by the ignorance of my questions and lack of understanding when I did venture into the wider world. In college and then again in seminary in the Boston area– my first and only daily contact with an actual city– I was a well-intentioned but largely naive white girl. I know that no one was under any obligation to be patient or loving with me as I blundered my way through that early awareness. And yet, time and time again, I’ve been met with people from a variety of racial, ethnic, and cultural backgrounds who have been patient, kind, long-suffering, and honest, people who have let me make mistakes and called me out gently but clearly. That’s not the responsibility of people of color, to educate and pull along their friends and classmates and peers. Each time, it is a vulnerable, unmerited gift. Thank you. 3. Where I see color, and where I don’t, and what that might mean. This is not something I’m proud of by any means, but it’s something I observed. Fascinatingly, as I was going through my friend list, person by person, looking at profile pictures and calling to mind friends by name, I noticed that there are some people whose ethnicity I instantly think of, while others I only was able to identify as non-white after thinking intentionally about it. Family members topped the list, followed by friends who are bi/multi-racial, and then followed by Facebook friends who I know in a particular role or function. What does this say about the times I “forget” the ethnicity of persons in my circle? That the role of family or of function is the primary category for my brain while skin color is secondary? That bi/multi-ethnic persons suffer the same erasure in my consciousness that these friends have also reported in their lived world experience? No conclusions here, but a hard thing to look at for me. 4. The choices I have made and can still make about where and how I make and keep friendships that shatter my echo chamber. Living outside Boston in a duplex instead of as a single person in an apartment downtown, trying to make friends “as a couple” with my first spouse, being immersed in the dominant cultures of the towns in which I’ve lived: these have increased the number of friends I have who look (and think and act) like me. Intentionally staying in touch with people I’ve met on travels, getting out on my own, looking for the people on the margins of my communities with whom I might actually have more in common: these are choices that have increased the diversity of my friendships in every way when and where I’ve made them. And the good news is, I get to pick how I approach the world, so I can continue to do the latter. But number five is the beauty. 5. The church is the place where I have broken out of my echo chamber. I realize that for some, the church is a homogenous, white, straight, middle class institution. Certainly for some, the church is less diverse than the rest of their lives. But for me, the church, The United Methodist Church, is a place where I have come in contact with and relationship with more people unlike me in every way, including ethnicity. When I look at those 76 people who are not white, nearly all of them are people I know through church— mission trips, the worldwide UMC connection, local connections and friendships that bring me into places and into the lives of people where I might not otherwise go. The church has made my life richer and fuller, given me colleagues and friends that I would not otherwise I have met, and opened to me a world of connection and grace that would never have been possible for me without it. For all its faults, the church has given me the extraordinary gift of a life that is broader than my own context. It’s incomplete, but that’s a beautiful kin-dom. So apparently, there’s a large segment of the Hunger Games fan base that doesn’t read very closely. This excellent article from The New Yorker follows one man’s efforts to compile racist and angry responses to casting choices for the movie version of “The Hunger Games.” Apparently, several people were upset to learn that Rue and Thresh (and most of the people from their district) were black. That’s pretty clearly stated in the book. 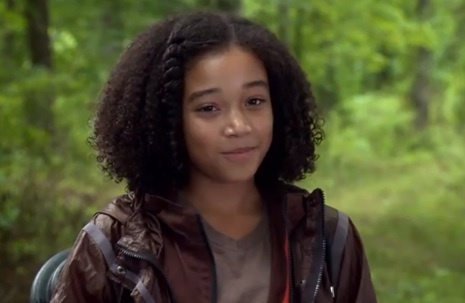 Not only are both Rue and Thresh described as having dark skin and dark hair, but just as Katniss’ District 12 is described as Appalachian coal country, the details of District 11 make it sound like a throwback to the old southern plantations. I thought the whole thing was a pretty obvious depiction of slavery played out in all the Districts, really, based not on race but on economic status and power. I remember being surprised that there weren’t more explicit references to people of color in the books– surely a futuristic America would be more ethnically diverse and not less. I viewed it as a glimpse of hope in the midst of a dystopia that Katniss and her fellow characters seemed far less aware of ethnic differences– perhaps since everyone is oppressed together, the subcategories don’t matter quite as much. But where I think readers may have been confused is because Katniss frequently says that Rue reminds her of her sister, Prim, who is quite clearly a fair-skinned blond-haired child. And this begs a question that I think we need to confront as part of our conversation about racism. Can a person remind you of someone else, or bear a strong resemblance to someone else, if they are of a different ethnicity? The answer to me is obvious: yes. I’ve said before that I neither grew up nor live in the most ethnically diverse place on the planet, but even moderate exposure to a diverse group of people will cure one of the notion that “all black people look alike” (or all Asian people, or Latino people, or white people). Not only do people embody similar characteristics and mannerisms (Katniss lifts up Rue’s timidity and gentleness as similarities with Prim), but there are shared physical traits as well (in the case of Rue and Prim, their size is similar, and I believe Katniss mentions their eyes). If someone totally unrelated to you has your grandmother’s smile, why is that any more or less likely if their skin is a different color? The underlying assumption, I think, is that a person is reduced to their race or ethnicity (or other minority status). Well, not any person. I’m not reduced to being a white person or a white woman. But that’s the privilege I receive. Someone else can be reduced to being the black person or the Asian girl or the gay kid. This is not okay. And yet, it seeps in, and I’ll be darned if I know how to pull it out by the root. In earlier blog posts, I’ve celebrated the relative innocence of my daughter’s assumptions about ethnicity. But now at seven, she has started pointing out skin color as one of the first traits she recognizes in people. It’s discouraging. It’s harder than it sounds, and harder than it should be. But I think part of it lies in questioning assumptions, lifting up heroes and heroines in literature and life who embody all sorts of diversity, drawing comparisons between people that may not be as obvious, and naming the places where we’ve had our own assumptions challenged. We can’t as a culture shy away from conversations about racism– our silence and discomfort can be fatal. We need to speak often, and loudly, about the assumptions and prejudices we find in ourselves, in our books and films and media, and celebrate the times and places where they are challenged. An article appeared yesterday in the Associated Press with a headline that I felt was way off. Here is my letter to the editor of the AP. I am writing to express my disappointment and anger over a very poorly worded headline “Was Fla. shooter a vigilante or good neighbor?” article by Mike Schneider, published 3/21/2012. It seems to me that the outrage and tremendous sorrow that this case has generated stems not from questions about the confessed shooter’s vigilantism or neighborliness, but whether or not that vigilantism tipped over into racially motivated and unprovoked killing. A vigilante, by definition, is a person who takes it upon him or herself to suppress or punish crime outside the sphere of law enforcement (Miriam-Webster). This term indicates taking the law into one’s own hands *when a crime is being committed or is about to be committed. 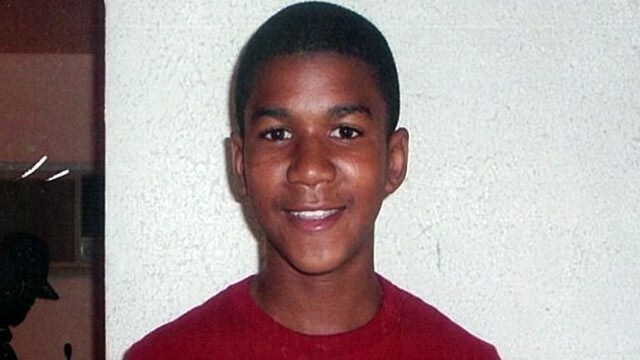 * In the case of the slaughter of 17 year old Trayvon Martin, unfolding evidence– which was in the public eye yesterday prior to the publishing of this article– reveals that this young man neither committed nor was about to commit any crime. In fact, he expressed on the phone to a young woman moments before his death that he felt unsafe because he was being followed. A more accurate question might have been, “Was Fla. shooter a vigilante or a murderer?” or “Was Fla. shooter a good neighbor or a cold-blooded killer?” The use of two suggested motivations– fighting crime and protecting the neighborhood, neither of which are borne up by the facts (no crime was committed prior to the shooting, and the neighborhood was not in danger)– negates the other side of this conversation, denying that there is something far more sinister and fearful behind Zimmerman’s actions, be it fear, racism, megalomania, or some combination thereof. Language is powerful, and as our society wrestles with the terrible truth of what happened to Trayvon Martin, we must be as careful as possible to be respectful of both the nuances and the strong emotions enveloping the families of both the victim and the shooter, the community in which this killing took place, and a nation that still has a lot of work to do when it comes to overcoming violence and racism. I feel that your headline yesterday missed the mark, and missed an opportunity to contribute to this national conversation in an informative and sensitive way. The other day, my daughter asked me about Abraham Lincoln at breakfast. While I applaud her faith in humanity, I did explain that sometimes people do things that are very very mean and do not make any sense. I love that her world is one where the very idea of something like slavery is so bizarre she assumes it’s unreal. We still haven’t really had a conversation about race. A couple of years ago, when Obama won the nomination for president, she asked who he was and why he was important. After his name and the position he was running for, I tried to explain why he was special in this moment in history. I said something like “see how his skin is a different color than mine?” She just looked at me with these big confused eyes and said, “I have skin. I like skin.” I shut my mouth tight. I’d be damned– pretty literally– if I was going to instill that in my daughter. So now I watch her with her friends, and although we live in the whitest state in the country, there are some kids in her class and her church whose skin is darker than alabaster. And she seems not to notice. I even ask her what she likes or doesn’t like about a classmate, or what makes a friend special or different, and she doesn’t mention skin color. She doesn’t mention if they have one or two parents or if those parents are the same gender. She doesn’t mention how people dress or what part of town they’re from or whether or not lots of other people like them. Which is as it should be. Would that we all saw each other like kindergartners do, and the only judgments we made were based on relationship and behavior. That’s true, and I am so honored to have the opportunity to teach two children something different, to raise a generation that can maybe look past race and sexual orientation and whatever else. But I can’t ignore these issues either, because I am not my daughter’s only teacher. Soon peers and classmates will have a huge pull in her life, and even if I have taught her otherwise, they get to have their say. Some of them may try to convince her to look down on others because of the color of their skin, the gender of their parents, their sexual orientation, their economic status, the clothes they wear, the way they talk, how much they weigh. Some of them may try to make her the victim. Kids can be nasty and bully each other for any (or no) reason. We’ve been seeing recently how deadly that can be, but it has always been vicious and violent. Parenting is a huge and fearful responsibility. Because as much as I believe you have to be taught how to hate, I also believe you have to be taught how to stand up to those who are hateful. In honor of National Coming Out Day, and to honor those who have lost their lives, and to share a message that I believe everyone should hear about bullying and our responsibility for it, I invite you to read a sermon by a friend and colleague of mine, Rev. Bri Desotell. President Carter came out and said it: some of the noise around President Obama is because of race. Some of the people who attack him personally– not politically, mind you, not those who have a legitimate debate about his policies– but those who rant and yell and make outrageous and erroneous claims about his nationality or eligibility for office– are acting out of a deep and almost subconscious fear of men of color, or a belief that black people are inferior to white people. Frankly, I’m surprised we’re surprised about this. I doubt President Obama is surprised; I’m sure he prepared himself for worse, in fact. Joe Wilson making noise during a speech s small potatoes, actually. It’s the stuff that revolves around heritage and religion and nationality that is really hard to ignore. And it’s really racist. There’s no other word for it. It is based on assumptions about people because of what they look like, and creating a hierarchy in which some ‘races’ are inferior to others. For example: A sign this past weekend read “the zoo has an African [lion], and the White House has a lyin’ African.” I’d think that to be considered ‘African,’ it would be good to perhaps have lived at least a few years of his life on the continent. But see he *looks* African; he doesn’t *look* ‘merican because all Americans are white and have blue eyes and rugged builds and wear cowboy hats. Nor can he be considered to be from his state of origin, Hawaii; everyone knows Hawaiians go around bare-chested, wear leis, and have slanty eyes. Yikes, racism. And are we meant to *not* compare the President of the United States to a wild animal in that scenario, because I really can’t be sure. It’s like the wild gorilla political cartoon a while back (although there I’m on shaky ground because I definitely *did* compare President Bush to a monkey, but I want to be clear that that was not because I’m a racist but because I’m an intellectual elitist pig. Also, some of his expressions were a little simian). And speaking of political cartoons and other clipart: I’ll be honest and say I didn’t get the watermelon thing. I grew up in the north in the post-post civil rights movement, and so I didn’t even know that there was some sort of stereotype about African American people and watermelon– no, I learned that from recent ‘humorous’ pictures of the whitehouse lawn covered in melons or ‘ObamaFoodStamps’ with melons on them. Classy, isn’t it, when one generation has to be re-taught the racial stereotypes of their grandparents’ day, because those stereotypes are back in use, addressing the leader of the free world. wow. Racist. Claims that President Obama is a Muslim. Leaving aside for a moment that I would have no problem with the President of the United States being and adherent of Islam or any other–or no other– spiritual practice, again, this is another connection that I have a hard time getting. I sense, though, that it comes from a belief on some people’s part that christians are anglo-saxon. This would have come as a shock to the first Christians (not to mention Jesus), who probably ranged in skin tone from deep brown to quite tan, but would not by any means have been northern Europeans. And today, adherents of the Christian faith come in every shade of pigment we can imagine, rivaled in diversity only by the fastest-spreading religion on the planet, Islam. So why presume that a particular person practices a faith other than what he has publicly professed? He’s black so he can’t be Christian? Somebody needs to tell Al Sharpton. And Desmond Tutu. But the real kicker for me are the ‘birthers.’ I can’t believe in this time and place that anyone is allowed to make such claims about the President’s birth place and not be called liar liar pants on fire racist bigot on the spot by a million bystanders. Question his law degree. Question his college diploma (goodness knows, I’ve wondered about Bush’s!). Question his meteoric rise to power. But wonder whether or not a half-century old birth certificate and birth announcement are faked? Insist that a man must have been born in Kenya because, what? I’m naming that for what I think it is: he doesn’t look like a *real* American. He’s black and all black people come from Africa. He can’t be allowed to be President because only people like us can be President. This is the height of racism-based fear and if folks aren’t red in the face about it with either anger or shame, then we have missed the point entirely.